Without integrated ticket management, issues get lost and take longer to resolve, and detailed customer support history is forgotten. Help desk software that can’t keep pace with business growth greatly reduces the quality of service delivered to end-users. Customization restrictions can create barriers between support staff and end-users and impact their customer service experience. Configure custom workflows and automations that meet growing end user support needs. Unify IT operations management (ITOM) and IT support for improved coordination and better end-user experience. An effective help desk solution enables lower operational costs and faster problem resolution. Improve productivity and resolution times with automated ticket assignment, routing, and escalation. The ability to configure and automate help desk software and processes is a necessity for growing enterprises. Not wanting to be bound by the limitations of legacy ticketing systems, enterprises look for higher levels of help desk system customization using functionality that allows them to align their support objectives with their organizational goals. Effective help desk software allows businesses to support multiple companies, departments, and projects, and escalate problems as necessary for faster resolution. Effective help desk software adapts to your organization's triage and escalation process. Easy-to-configure technician groups and tiered fulfillment levels facilitate intuitive service for ticket resolution. Escalate issues to the right team members quickly and easily, leading to satisfied end-users. Enterprise organizations need a help desk system that blends well with their existing IT operations management software, such as integrating with asset management, network management, systems management, and other software that supports the performance and availability of IT operations. This functionality allows tickets to be automatically created and acted upon when performance issues, faults, failures, and configuration changes (planned or otherwise) arise. When selecting a IT support software, enterprise businesses are often forced to choose between affordability, flexibility, and ease of use. The goal isn’t to sacrifice one for another, but rather, to find a solution that is cost effective, configurable, and simple to learn. 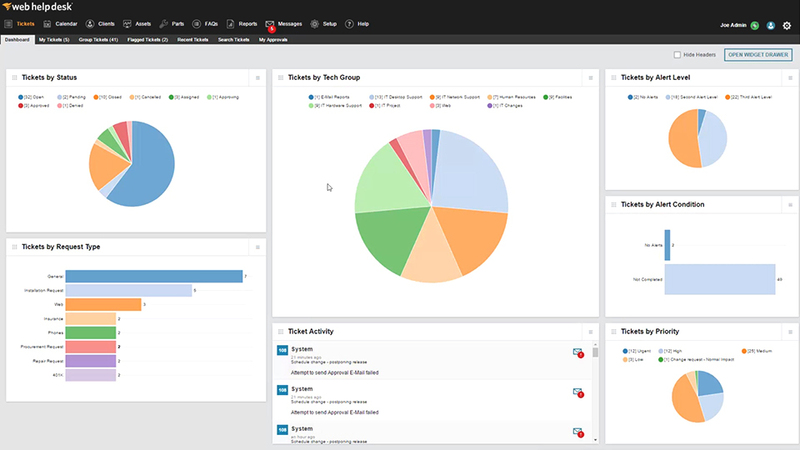 Automated ticketing allows enterprises to automate ticket assignment, routing, and escalation to the right agent at the right time. Save time and manual effort for the help desk team, and improve help desk agent productivity. Customer service is improved as issues are resolved quicker and more efficiently. "We are more than satisfied with our decision to purchase Web Help Desk. It has every feature that we require in our particular environment. It's simple to use, fully customization, and integrates with several other SolarWinds products. Obtaining technical support from Solarwinds is also easy and extremely fast. This product is receiving regular updates and continues to grow and improve over time."